I'm not inventing the wheel here. I'm certainly not re-inventing it, either. In this installment of my "How to Series," I'm focusing on a topic that should be near and dear to the heart of every writer. Let's back things up, shall we? You pour your heart and soul into your writing. It is a lovely, rewarding, frustrating, cursed, and wondrous thing. So why not do everything in your power to make sure those words and images NEVER disappear? Today, I'm writing about the importance of backing up your work...and keeping yourself protected. I'm interested in tech. I love it. I'm not particularly good at techie things like rebuilding computers or taking a hydro-spanner to a stubborn hyperspace drive, but I do marvel at things that make life easier. I believe we should embrace these things. At the same time, our wondrous technology sometimes fails us. The internet goes down; your hard drive goes supernova (or your PC simply dies). Pages and pages of writing, tens of thousands or hundreds of thousands or millions of words lost. "I felt a great disturbance in the Force, as if millions of words suddenly cried out in terror and were suddenly silenced." This happened to me once. My makeshift PC was the Millennium Falcon of computers. Sometimes, when starting up, it sounded like the Falcon's broken hyperdrive in The Empire Strikes Back. One day, it simply decided not to work. It would not power on. My short stories and novels were trapped in the computer. I was thankful that the hard drives still functioned; I was able to hook them up and extract the data. I was fortunate. Now, I have backups. And backups for my backups. These guys are my best friends. Actually, just the Cruzer there is my best friend. The other one belongs to my wife. Yeah, I know...they're predictable. I back up everything on my flash drive. Each and every short story and novel is on there, organized in different folders so I can find things easily. They're handy to have around and allow me to take my work from computer to computer. They do have a couple of minuses, however. 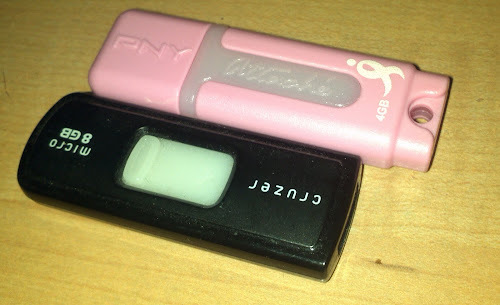 Flash drives can easily spread viruses...and because they're small, they can also be easy to misplace. Still, a very useful backup. A few months ago, Dropbox sent the internet abuzz because of a change in its terms of service that some felt could surrender their own rights to their files (read about it here). Dropbox is a big flash drive in the sky--a service that exists in the Cloud. You don't have to take it anywhere because it's already everywhere. Just register a username and password, download the program on your computer, and your files are instantly available. Dropbox has apps for iPhone and Android, so if you like to read on your phone, you can view your stuff there (also handy for transferring pictures in a pinch). If Dropbox's terms of service have you hot and bothered, there are always other services like Google User Managed Storage, Microsoft Skydrive, SugarSync, and more (here's a good comparison on all of these from Gizmodo). I'm a big fan of Dropbox because it is very user friendly, but you may favor another option. Just have another option, please! Before Dropbox, I often emailed my documents as attachments to myself. This is the most redundant of redundancies; I would store the file in my sent folder AND inbox. I've used Yahoo! Mail for years, so I tend to stick with it. A lot of people prefer Gmail, and I have no problem with that. Technically, I suppose this is also a "cloud" solution, but I thought it was worth mentioning. This "backup" doesn't always have the most up-to-date version of a story, but if everything else crashes, at least there will be something salvageable here. A pleasant benefit of owning a Kindle is the ability to email stories to myself. I don't really enjoy sitting in front of a computer for hours while trying to read something I'm working on. 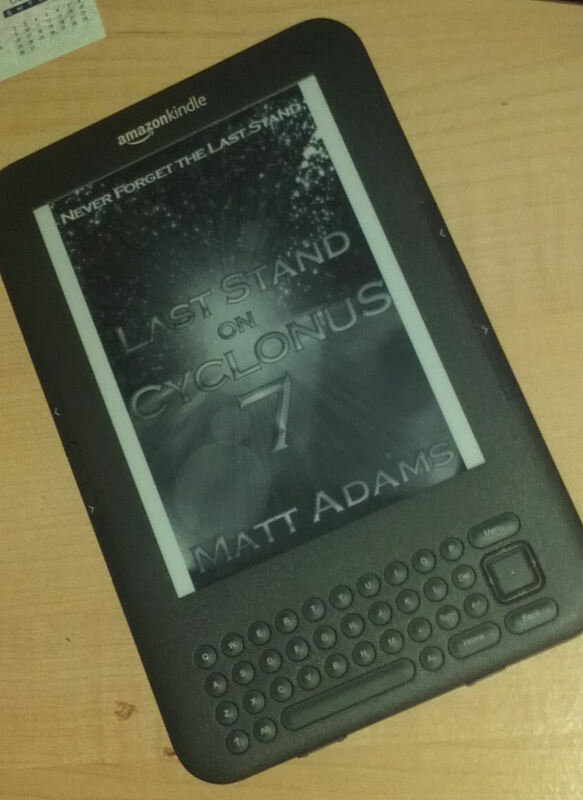 Emailing it to my Kindle allows me to kick back on the couch or in a recliner to read my work. If something were to happen to the file on my hard drive, the Kindle can act as a USB so I can get the file back. 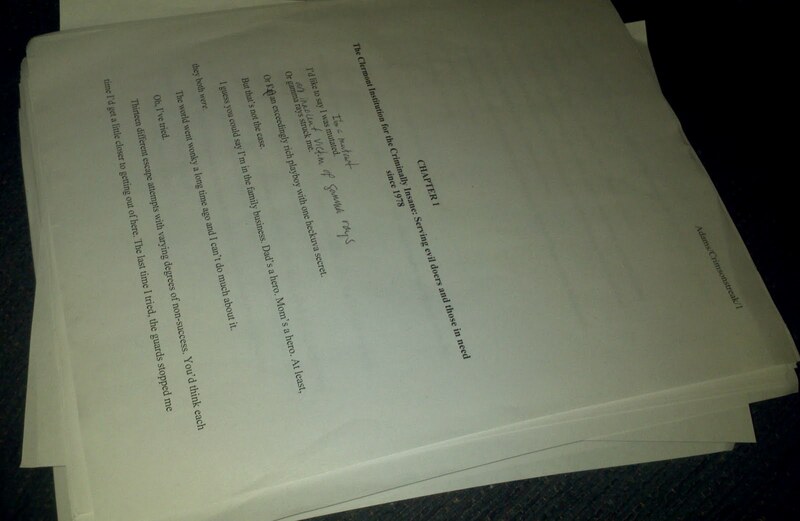 This also has a double-layer of redundancy--since I emailed my document, there's a copy in my sent folder as well. Listen, I don't want to sit down and transcribe 400 pages of a manuscript that crashed and burned on my hard drive, email, flash drive, or cloud application. However, IF something were to take a death ray to those files, a hard copy is better than nothing. There are even some services that can scan your pages and turn them into a file you can edit. My point here is as follows: something is better than nothing when it comes to backing up your writing. What about you? Do you have any special "tricks" to keep your files intact? New short story out today!